The Q-biotype whitefly, a significant pest that could damage agriculture, has spread from Palm Beach to seven other Florida counties, according to a University of Florida Institute of Food and Agricultural Sciences (UF/IFAS) researcher. The whitefly species has now been reported in homeowners’ yards and on plants in retail nurseries that are destined to be planted in yards as far north as Duval County. It’s also in Broward, Highlands, Hillsborough, Martin, Pinellas and Seminole counties, Osborne said. Inspectors from the Florida Department of Agriculture and Consumer Services (FDACS) are in the process of tracing the flies back to the wholesale nurseries that shipped the plants to the retail stores. From there, nurseries can work with UF/IFAS on appropriate management practices. For identification purposes, infested leaves and dead insect specimens should be brought to local Extension offices. Wrap in a dry paper towel and place in a sealed plastic bag and then in an envelope. Freezing the specimen overnight before transport is highly recommended. Live insects should not be transported. The collection information should be included with the sample. Date, location, what type of vegetation is affected, number of suspected whiteflies and any information about whether a pesticide has been used on the plant is helpful information to managing the pest. For steps on how to submit a sample to the FDACS Department of Plant Industry, visit http://www.freshfromflorida.com/Divisions-Offices/Plant-Industry/Business-Services/Submit-a-Sample-for-Identification. 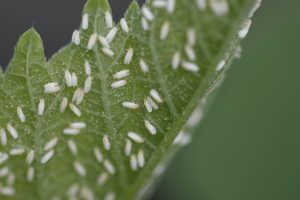 Landscapers and pest control operators should inspect for signs of whitefly pests, communicate with neighboring properties and homeowners associations, employ good management and growing practices and implement whitefly management guidelines available at http://mrec.ifas.ufl.edu/lso/bemisia/bemisia.htm. Nurseries that suspect whitefly infestations should contact Cindy McKenzie at cindy.mckenzie@ars.usda.gov. She will only report positive finds to the county level. Growers will not be identified. Please also check out the UF/IFAS whitefly management program.